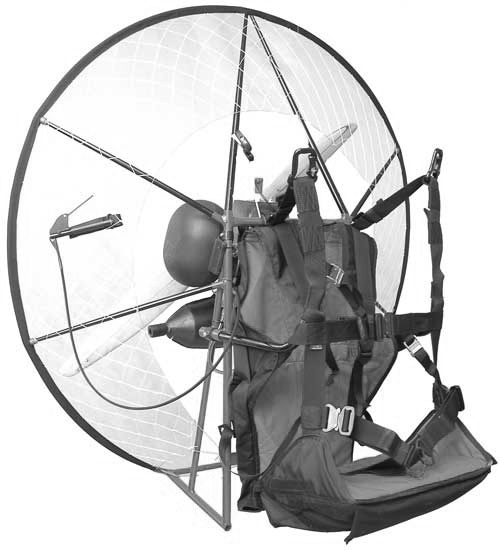 The PSF Harness, designed by Per Il Volo in 1996, has become the classic paramotor harness copied and used by most of the important paramotor manufacturers around the world. The high hangpoint system inherent in this harness balances the wing and gives the pilot a stable flying sensation, keeping them at ease during flight. For the PSF machines made before 2016, have a look at the Miniplane Harness Web Page for the best way to set this harness up. Please note: The PSF and ABM harnesses attach to different points on the Frame. The ABM attaches to the upper holes in the Upper Frame Extension (curved), while the PSF attaches to the lower point where the Upper Frame Extension attaches to the Frame (see photo - click to enlarge). The next step in the assembly is the Propeller.